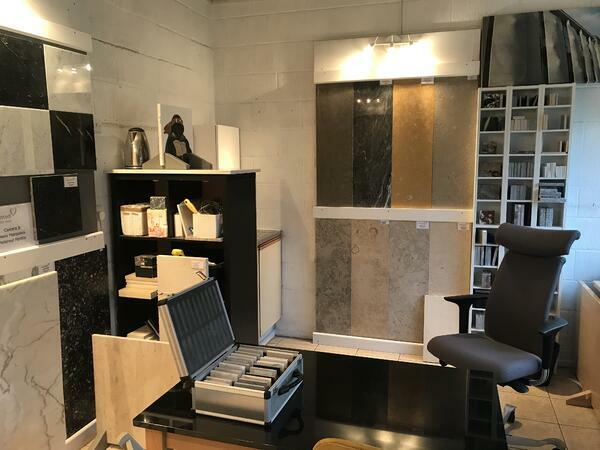 We would be delighted to welcome you to our new natural stone showroom in Arborfield, near Reading. Over the course of the Christmas holidays, we emptied our old warehouse and workshop and moved to our new premises. We now have a more comfortable showroom where visitors can enjoy a cup of freshly brewed tea or coffee and stroll around the 12 acres of landscaped gardens. The new showroom is in Pudding Lane Nursery in Arborfield on the site of a well established garden nursery. We specialise in French limestone and also work with other carefully chosen quarries in Europe that meet our strict requirements as a pioneer member of the Ethical Stone Register. Which French Limestones can you see? You will have a choice of French limestone from dozens of different quarries from various parts of France. You will be able to see a large sample of most of the stones and several smaller samples with different surface finish options to give you a good impression of the variation that is possible from each quarry. Additional new samples are on their way to us now and we will be bringing in still more as we visit new quarries throughout the coming year. Alongside all the larger samples, there will be smaller "swatch" samples for you to take home. The samples are from our partner-owned quarries in Burgundy and south west France and from our trading partners all over France. The range includes the famous heritage building limestones such as St Maximin, the stone that built most of Paris, Tuffeau, the limestone chosen to build the greatest chateaux of the Loire valley and Caen stone, made famous by William the Conqueror. Our Lavoux (Lépine) limestone is now used for the restoration of Canterbury Cathedral, York Minster as well as for cladding contemporary new builds. It has also found favour with the UK's best sculptors for its ability to carve evenly and hold a neat, sharp edge. The range of flooring limestone includes the greatest names from Burgundy including Magny and Chamesson which appear in prestigious buildings across the world. The full range is listed on our main French Limestone web page. 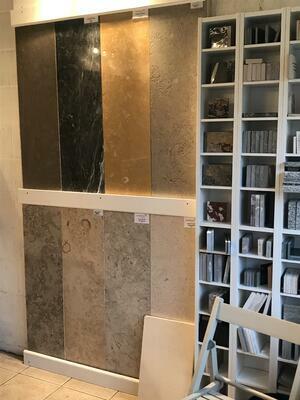 Which other Natural Stones are in the showroom? Alongside our range of French limestone, we also keep samples of French marble and granite and other European stone from Portugal, Spain, Germany, Belgium and Italy. 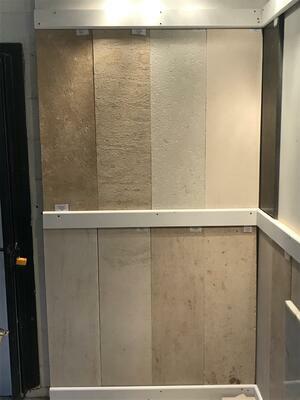 From the Sarancolin marble quarry in France, we have samples of Opera Versailles and Opera Fantastico plus some lesser known variations from the same quarry. These marbles have been used in the Palace of Versailles and many other prestigious buildings around the world. Also from France, the black and white marble of Grande Antique, the grey marbles of Henri IV and Sainte Anne as well as the more famous Bleu de Savoie (which ranges in colour from light blue/grey to near black). There is also Rouge Languedoc and its pink and cream variations. Other marbles include the Spanish Macael in both white and grey forms, an excellent marble used in the Alhambra Palace in Granada. We also have samples of the rare green and yellow variations. Here's the link to the marble on our main web site. Tarn Silverstar granite from the mid-south of France is one of our most popular granites and it has been used in Gaudi's Sagrada Familia in Barcelona as well as the Tsunami Memorial in London's Natural History Museum. Our French Granite page has more details and photos. We have Jura limestones from Germany and Moleanos, Moca Creme and Ataija limestones from Portugal as well as many lesser known stones. There is still work to be done in the showroom but we are open for visitors and would love to welcome you with a fresh-brewed coffee or tea. While you are here, you can also have a look round the large garden nursery and small antiques shop that we have on site. Are there any aspects of using, choosing or maintaining natural stone that you would like us to cover? Tell us by adding your comment to the form below. We love getting your feedback and are here to help you with your natural stone projects.